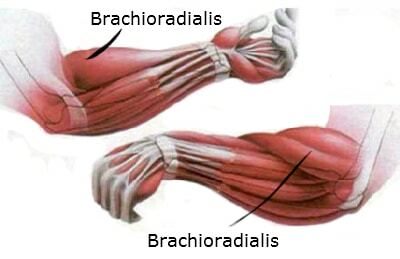 The brachioradialis is often a forgotten muscle but it can add a lot of additional arm size! Now, the forearm muscles are located between your elbows and wrists but many people don’t understand how to train them for maximum gains. However, we know the secrets to getting Popeye-sized forearms… and it’s all about the brachioradialis! The muscle starts from about mid-forearm and runs into the lower end of the humerus. Now, many people who weight train are severely lagging in the brachioradialis department, and this means you’re not reaching your fullest “arm size” potential. When it comes to genetics, there’s little we can do to change this because we are born with predetermined muscle attachments and this often dictates how large a muscle can grow. But, all hope is not lost just yet… you can increase still increase muscle size by utilizing effective exercises, and techniques. So How Do I Make Them Grow? Well, any exercise which involves elbow flexion effectively stimulates the brachioradialis muscle. What Are The Best Brachioradialis Exercises? That’s it! 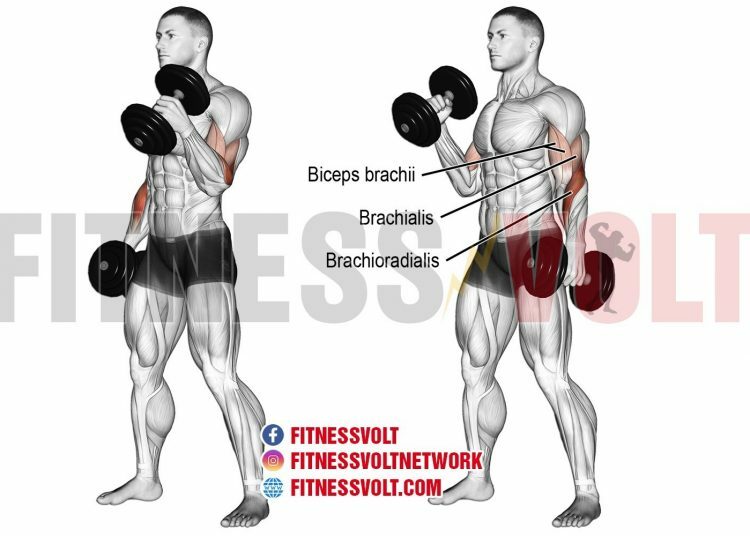 You only need a few different types of brachioradialis isolation exercises in addition to your back and bicep compound movements. Overhand (Supinated) reverse curls are performed by simply curling a barbell with an overhand grip rather than an underhand (Supinated grip). Hammer/neutral grip curls are performed by curling a dumbbell with neither a pronated or supinated grip, but rather a neutral grip! Pull-Ups are awesome whether you use an overhand or neutral grip and pulling your body weight up will surely build those brachioradialis muscles. Cable lat pulldowns allow for more elbow flexion than other back exercises like rows because of the high pulley angle, and because of the slightly leaned back body position during the exercise. Don’t be afraid to perform higher reps with these exercises as this will cause a good growth stimulus for the forearm muscles. The brachioradialis is a stubborn muscle so you can afford to do a little more to get them to grow! Simply place your thumbs on the bar in the same direction as your other fingers. By not using your thumbs during a curl, you force the brachioradialis to work even harder since you’re taking away thumb strength; which makes the muscle work harder to curl the weight when using either a pronated or neutral hand position. You don’t need to do a whole lot in terms of adequate training volume other than to just include a few extra brachioradialis exercises into your workout (Although you must train them with high intensity and even higher reps). Now, it’s recommended to perform the brachioradialis-specific exercises first in some of your workouts because you’re strongest at the beginning before you’ve already burnt out. And plus, you’ll have more grip strength and won’t have to worry about your hands giving out before your forearms do. There’s nothing too complicated about training the brachioradialis for growth. Just implement more sets and reps of the aforementioned exercise and you’ll see results, no doubt! Many people focus too much on regular bicep curls, and although they do work for building the brachioradialis; there are some special exercises which work a bit better. But, the biggest thing to take away from this is… using a pronated and/or neutral grip is key for effective brachioradialis training, and making gains! “Brachioradialis”. UW Radiology. Retrieved 2019-04-08. Boland, Michael R.; Spigelman, Tracy; Uhl, Tim L. (2008-12). “The function of brachioradialis”. The Journal of Hand Surgery. 33 (10): 1853–1859. doi:10.1016/j.jhsa.2008.07.019. ISSN 1531-6564. PMID 19084189. Caufriez, Benoît; Dugailly, Pierre-Michel; Brassinne, Eric; Schuind, Frédéric (2018-3). “The Role of the Muscle Brachioradialis in Elbow Flexion: An Electromyographic Study”. The Journal of Hand Surgery Asian-Pacific Volume. 23 (1): 102–110. doi:10.1142/S2424835518500145. ISSN 2424-8363. PMID 29409427.